Kaun Banega Crorepati Season 9 Promo: Amitabh Bachchan's Ready For The Big Night. Are You? Kaun Banega Crorepati 9: There's also a glimpse of the hurdles Big B faced in the early days of his career - "Aisi personality ke saath hero kaise banoge?" 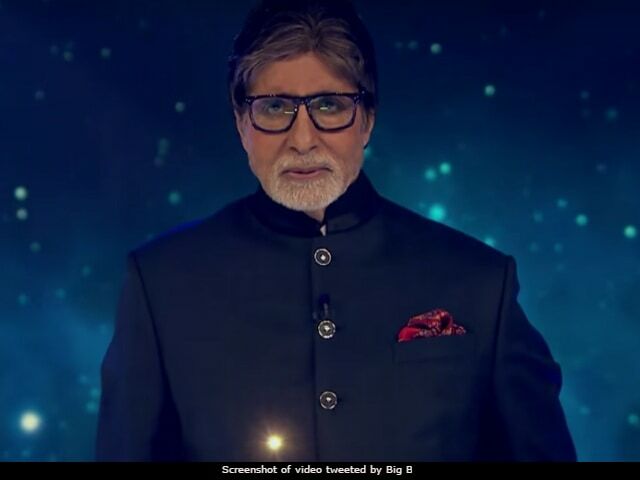 Big B tweeted the promo, introducing as "The KBC opener"
Amitabh Bachchan shared the promo of Kaun Banega Crorepati 9 a day ahead of its debut on Monday night. The 74-year-old megastar tweeted the three-minute-long promo along with a photograph of himself from the sets, introducing it as "The KBC opener." Abhishek Bachchan, who also shared the video, cheered for the show, saying: "Ab jawab dene ka waqt a gaya hai." This year, the look and feel of the show is completely fresh and so is the promo of Kaun Banega Crorepati 9. The video allots Big B comparatively lesser screen-space and shifts to montage of hand-picked non-celeb personalities and the challenges they battle every day. In the promo of KBC 9, Big B has actually enlisted a series of often asked inquires which question one's self-worth. Perhaps many will relate to these, as included in the video - "Doctor engineer nahi banoge toh kya karoge? ", "Kala se bhala pet bharta hai kya? ", "Kyun khamokha ladko ki barabari karna chah rahi ho." There's also a glimpse of the hurdles Big B faced in the early days of his career - "Aisi personality ke saath hero kaise banoge?" This year, the much-awaited question-answer format show will be interesting in more than one ways with the introduction of several new elements. Kaun Banega Crorepati 9 will have new lifelines like 'Video-A-Friend' and 'Jodidaar'. The show will also allow participants to bring along a partner to join him/her on the hot seat. However, the highlight of the show is the introduction of the 'Jackpot Question' - one that gives the participants a chance to win Rs 7 crore at one go. Kaun Banega Crorepati 9 will premiere tomorrow at 9 pm on Sony Entertainment Television and will air for an hour every day of the week till Friday.